Even the most die-hard baseball fans don't know the true story of William “Blockade Billy” Blakely. He may have been the greatest player the game has ever seen, but today no one remembers his name. He was the first--and only--player to have his existence completely removed from the record books. Even his team is long forgotten, barely a footnote in the game's history. It's no secret that I'm a Stephen King fan. After all, I have a copy of every book he's ever written--more than one format for some--and absolutely love the way he spins a tale. 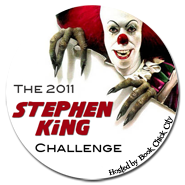 But I've fallen behind on my challenge to read 6 King Books this year. lol. So, when hubby suggested I try this book, I shrugged and got started. I read the first 30 pages in one sitting, and was totally intrigued. Then, I found out there was another story included as well, which made me happier. 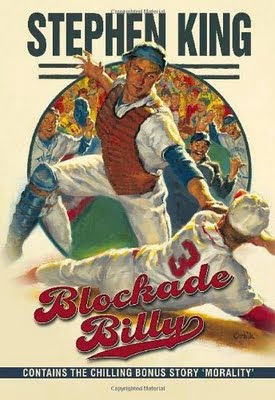 BLOCKADE BILLY: Tells the story of why Blockade Billy was wiped away from all the history books. It's told by Granny, now an old man and wanting to share his story with King, himself. In typical King fashion, I enjoyed finding out how it all turned out. Man, he tells an awesome story! MORALITY: Wow, this story was excellent! What starts out as a story between two, happily married people having a hard time making ends meet, turns into a depraved story of violence. Nora is a nurse and takes care of Reverend George Winston after he suffered a stroke. Chad works as a sub teacher and is also writing a book that may (or may not) sell. When the Reverend makes Nora an insane offer of getting a one-off payment that will help give them some financial freedom, they find themselves in a dilemma. Because what he wants her to do in order to get this money is totally immoral, and challenges them until they make a final decision. And like every indecent proposal, no matter how much they say they'll stick together and will make it through, their simple lives are thrown into instant chaos--with some very violent consequences. Man, this story kept me hooked right until the very end. Loved it!